Gerrard-Ashdale Library – see Ashdale events brochure at the library, at the corner of Ashdale and Gerrard St. East. Learn the basics of French for use in everyday situations. This course covers the basics using a combination of grammar, vocabulary, reading and conversation. Duke Of Connaught School, 70 Woodfield Rd. Mon 6:30-8:30pm started Sept. 16 for 11weeks — $156 ($94 sr). See page 30 of the brochure. And of course our farmer’s market in Jonathan Ashbridge Park (a.k.a. Leslieville Farmers’ Market) continues on Sundays, 9 to 2 until October 27. This entry was posted in Applegrove Community Complex, Duke of Connaught Public School, Gerrard-Ashdale Library, S.H. Armstrong Community Recreation Centre on September 26, 2013 by The Ashbridge's neighbourhood. 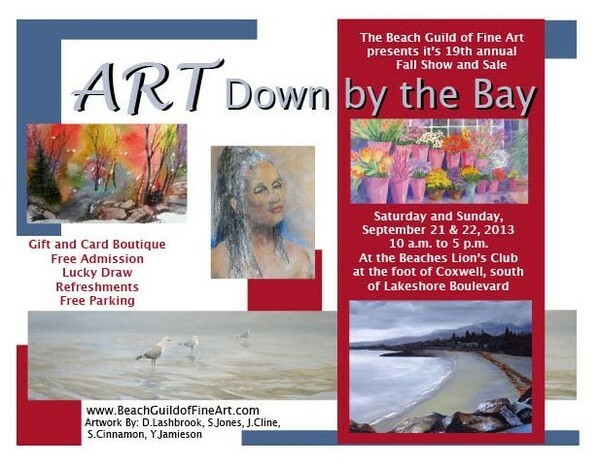 Next weekend visit the Beach Lion’s Club, Ashbridge’s Bay, for the Beach Guild of Fine Art’s 19th Annual Fall Show and Sale. Sat. Sept. 21 and Sun. Sept. 22, 2013 from 10am – 5pm. Opening reception Fri. Sept. 20 from 6pm-9pm. This show will feature paintings by over 40 of the Guild artists, and is a great opportunity to view and purchase art by some of the most well-known Beach artists. In addition to the large art show, there will also be the popular gift boutique. The boutique features very small original works of art (nothing over $150), plus artist’s original prints and cards, at reasonable prices. As always, we will be having a lucky draw. Free admission and parking in the clubhouse lot. 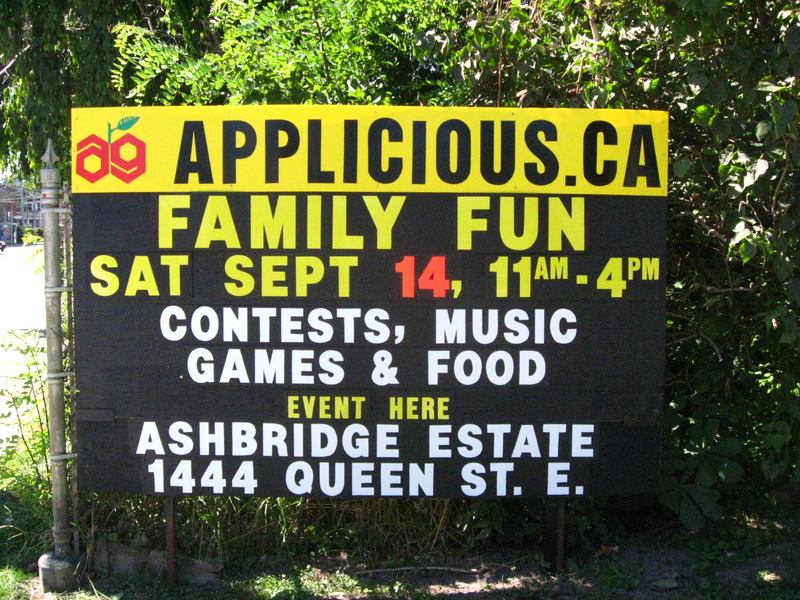 This entry was posted in Ashbridge's Bay, Beach / Beaches, Event on September 15, 2013 by The Ashbridge's neighbourhood. Family fun, contests, music, games and food. In general,good times. Fundraising event for Applegrove Community Complex, our fabulous community centre. 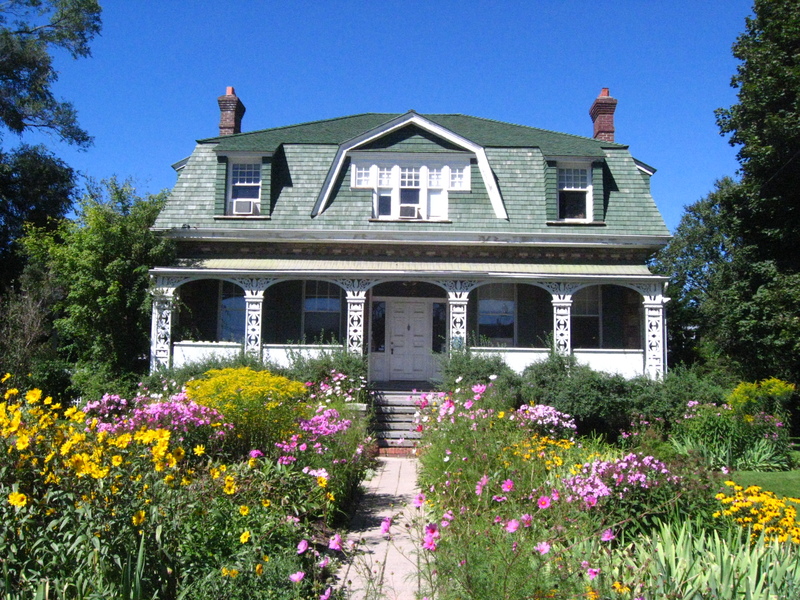 Ashbridge Estate grounds, 1444 Queen East. 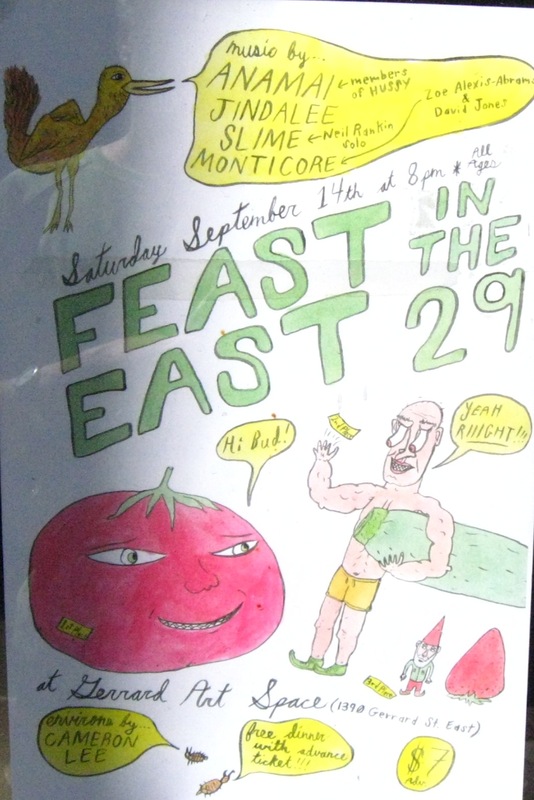 8 p.m. Music and food, Gerrard Art Space, 1390 Gerrard East. Click on the poster at right for details. French-Beginner: Learn the basics of French for use in everyday situations. This course covers the basics using a combination of grammar, vocabulary, reading and conversation. Duke Of Connaught School, 70 Woodfield Rd. Mon 6:30-8:30pm starting Sept. 16 for 11weeks — $156 ($94 sr). See page 30 of the brochure. Check the fall programs at S.H. Armstrong, Applegrove, Gerrard-Ashdale Library and East End Community Health Centre. 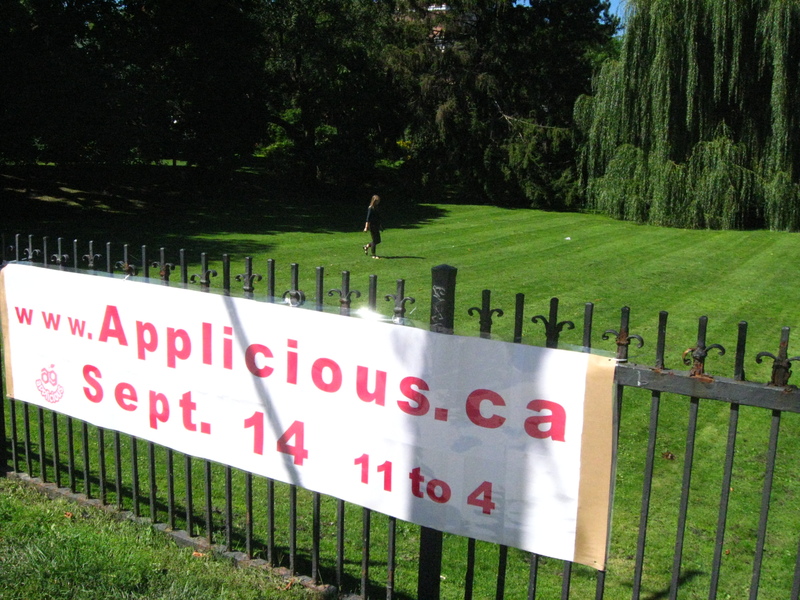 Ashbridge Estate will be buzzing Sept. 14 for Applicious — see our previous post for links to photos from last year’s event (and a video). This entry was posted in Applegrove Community Complex, Ashbridge Estate, Duke of Connaught Public School, Event, Gerrard-Ashdale Library, Queen Street, S.H. Armstrong Community Recreation Centre on September 7, 2013 by The Ashbridge's neighbourhood.